'Elizabeth Warren' Highlights All Of The Senator's Positives Antonia Felix's new biography is a flattering portrait of a senator — no doubt by a strong supporter — whom many see as a contender for the 2020 Democratic nomination for president. Her Fight. Her Work. Her Life. If you're sick of reading about the midterm elections, there's some good news: It will all be over in just a couple of months. Then you can bask in the period of time between Election Day and the start of the 2020 presidential campaign, which sometimes can last as long as 15 minutes. And over the next two years, you can look forward to a slew of memoirs by, and biographies of, politicians who are considering running for president in 2020. 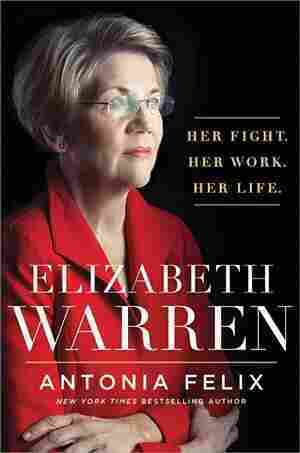 One such biography, Antonia Felix's Elizabeth Warren, hit the shelves Tuesday. It's a serviceable look at the life of the senator from Massachusetts, written by an author who doesn't disguise her love for the Democrat widely believed to be considering a presidential run. Elizabeth Warren is by no means a neutral biography and, to her credit, Felix never claims that it is. The book boasts blurbs from several prominent Democrats, including Rep. Eliot Engel of New York, former Surgeon General Richard Carmona and Democratic strategist Steven Jacques. In the opening pages of the book, Felix gushes that the people she interviewed while doing research for the book described Warren "as energetic, open, warm, genuine, unaffected, and kind." Felix traces Warren's career from her childhood in Oklahoma, where she grew up in a working-class family. "She tried to hide the fact that her parents struggled with money, making a silent agreement with her dad to get dropped off in the rusty Studebaker a block away from school," Felix writes. "Everyone else seemed to have a shiny new car, and she imagined herself the only student from a family with money problems." Warren is known today as one of the more progressive voices in the Democratic Party, but this wasn't always the case. She bantered with her best friend in high school over their political differences; Warren was a young Republican who teased her Democratic friend about her "socialist" friends. A skilled high school debater, she continued the hobby at George Washington University, before dropping out to get married to her high school sweetheart. Warren later finished college and went to law school, after which she began her long career as a law professor and an advocate for consumers' rights. Felix does an excellent job detailing Warren's work as an adviser to the National Bankruptcy Review Commission, and as a co-author of two academic books on bankruptcy and debt — it's an esoteric subject that Felix explains quite well. Felix also ably describes Warren's rise to fame, which coincided with her role as architect of the Consumer Financial Protection Bureau. Warren booked appearances on The Tonight Show and The Daily Show — her appearance on the latter program was so nerve-wracking, Warren threw up backstage before the taping. Much of the book's final section focuses on Warren's 2012 race for the U.S. Senate, in which she defeated Republican incumbent Scott Brown. There's no doubt that Felix's biography is the work of someone who fervently supports the senator. She refers to Warren as "Elizabeth" throughout the book, and it ends with several pages of quotes and speeches from Warren. There's nothing in the biography that really resembles criticism of the senator or her politics. That said, Felix does make some intelligent observations about the cultural perception and media coverage of Warren. She correctly notes that despite Warren's image as a radical liberal, she's "actually a fervent capitalist who believe[s] in safety nets." And she criticizes the way that the controversy over Warren's claims of Native American heritage played out in the press: "The campaign did not ignite a national conversation in which Native Americans could weigh in about the many dimensions of Native identity. It didn't provide a space for them to explain the deep cultural reasoning behind the frustration of many over white claims of ancestry." And Felix definitely understands the appeal that Warren has to working-class progressives, writing that "in simple language, she spoke to the anger and confusion of Americans who had seen the social contract erode into a system that didn't work for them but worked extremely well for those on top." It's a concise explanation of Warren's meteoric rise in politics, which saw her go from respected academic to Democratic superstar in a matter of years. Elizabeth Warren is the kind of book you can imagine a (hypothetical!) Warren campaign buying in bulk to give to curious voters — it's a flattering portrait of the senator who many see as a front-runner for the 2020 Democratic nomination for president. Still, it's a little better than it has to be: Felix is an excellent writer, and her book is, at its best, quite interesting.